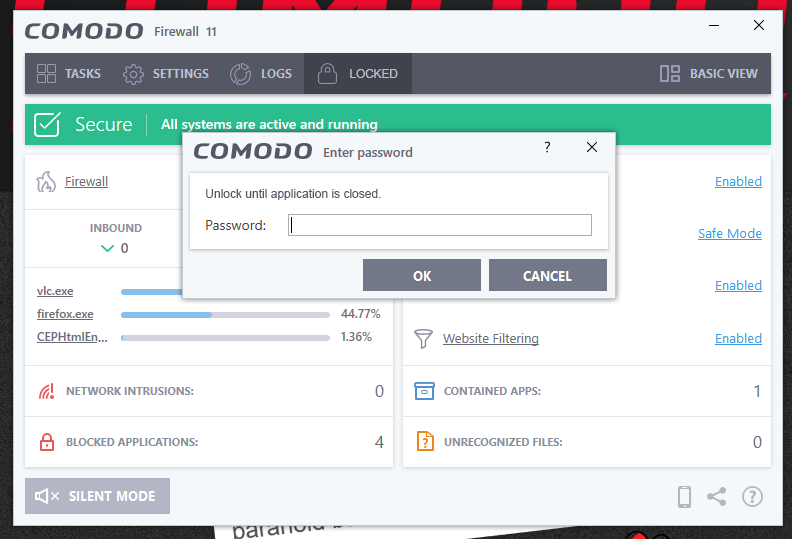 When a password is set, Comodo asks for a password for every single change made. Allow the user to make multiple changes when the program is open and only ask for the password again after the main window is closed or after a certain time period has elapsed. Inputting the password after every single change is tedious. Other programs allow the user to make numerous changes after a password has been entered once. Until the application is minimized or the PC rebooted. It is a pain that you have to keep typing in the password when moving from Logs, Settings, Killswitch, Unblock Applications, Clear Containment and so on. It would greatly improve the UX by simply allowing a temporary application unlock. To perform an application unlock I would simply add a Padlock button to the top menu which allows the application to unlock until it is closed. I don't think there is a need to set a time limit for this as you can just keep the application open if you need to go back to it. Just my opinion.